Our experts examined a vast number of popular pocket knives before selecting 19 of the best for rigorous testing. We consider reasonable criteria like cutting ability, portability, construction quality, and ergonomics. We also weighed other important factors like availability, affordability, and aesthetics. Each knife we review has seen weeks of "everyday carry," been taken on extended backcountry trips and performed a suite of standardized tests. The end result is the internet's best dang pocket knife review of 2019. Immaculately constructed knife in a form-factor that is easy to carry and large enough for virtually every task. A solid little knife for all-around “every day carry”. With assisted opening, this model would be similar enough to our Editors' Choice to really complicate our assessment. Full-size, basic folding pocket knife with immaculate construction. Compact, carefully designed knife for the discerning user that seeks uniqueness and can forgive some usability issues. The full size version of our Editors' Choice is less portable with minimal but real gains in usability. If you know you need a full size pocket knife, the Barrage 580 is a great choice. The Benchmade Mini-Barrage 585 is built for precision with a design that helps it maintain its Editors' Choice status. Its blade arrives razor-sharp and Benchmade's LifeSharp sharpening service sweetens the deal. If you cover shipping costs, they will return the edge to factory specification through the life of the knife. The handle fits in the palm well and the knife tucks easily into a pants pocket. An assisted opening system, deployable by either hand, reliably pulls the blade to "ready" status. For carrying in a pocket or purse, the blade can be safely locked in the closed position. Finally, our hunting-focused testers endorsed the knife's fine-edged prowess, carrying it as their primary blade for backcountry hunting missions. This is an expensive product. Over a long lifespan, especially with Benchmade's "LifeSharp" service, you will undoubtedly realize the value of the Mini-Barrage. However, if you are somebody who easily misplaces equipment like this, the initial investment may be a bit too much. Also, for heavy tasks and frequent usage, its slightly down-sized stature will be noticeable. As long as you aren't using it for hours and hours a day and as long as you can keep track of it long enough to realize the investment, the Mini Barrage earns our strong endorsement. Up-size to the Benchmade Barrage for more functionality but bulkier carry. The Kershaw Leek packs a pedigreed blade into a compact, assisted-opening tool at half the price of other high-end knives. The blade is made of high-grade steel and comes sharp from the factory. Like the assisted opening of the Editors' Choice-winning Mini-Barrage, the Leek can be opened with either thumb and can be locked closed. Also, Kershaw has engineered a tab on the rear of the blade that allows blade deployment with the index finger. For handy carry and light to moderate use, the blade and handle hold up just fine. The Leek's primary compromise is the narrow handle profile. Compared to our Editors' Choice winner, the Leek is similar in many dimensions, but both the blade and the handle are thinner than those on the Mini Barrage. Some users will appreciate the lower profile for carrying, though edge and handle thinness requires tradeoffs. The thin blade is nice for soft and light cutting but can deform in heavy use. The thin handle doesn't comfortably support heavy pushing anyway. Kershaw currently sweeps our Best Buy awards. The Leek brings all the functionality we like, but compromises some on materials to hit a price point. At an even lower price point, we really dig the Kershaw Chill. The Chill strips away the assisted opening and thumb studs and the materials are also downgraded, just a little, from the Leek. The end result is a product that competes on price with the novelty knives you might find at a flea market, but brings high-end construction quality and materials that will stand up to actual use. The Kershaw Chill is best compared to the Opinel No 8. The Opinel briefly held a Best Buy Award, but the Kershaw edged it out. The Kershaw is a few dollars more expensive but is more compact, features a pocket clip and one-handed opening, and has a sturdier construction for extended and rugged use. The Kershaw is a little heavier, but both have slender, long blades that are great for backcountry kitchen use. The Victorinox Classic SD Swiss Army Knife earns our Top Pick Award for its keychain readiness. Significantly more compact than your car's door remote, this Victorinox is unobtrusive and ready for action. When needed, the small blade rises to most occasions. Our lead tester's first pocket knife was a Victorinox Classic, 30-some years ago. His whittling, prying, and poking never bent or broke the blade. Adults love the Classic for its grooming tools and compactness. The scissors appear toy-like but can cut things as rugged as rock climbing webbing. For routine tasks, the scissors excel. While we never had issues with the durability of the Classic, it is clear that it is not as robust as more substantial and heavier knives we test. Similarly, the tiny blade is a definite step down from something like the full-size Top Pick SOG Trident Elite. If this is okay with you, and you have room on your keychain for another little piece of equipment, the Victorinox Classic will find daily use in your world. We grant Top Pick awards to specialized gear excelling in a subcategory. Among the tactical, rescue-oriented knives tested, the SOG Trident Elite stands out. When compared to close competitors, the SOG is lighter and has a blade made of better steel. SOG is well-known for its blades of powerful AUS-8 steel, even on their most budget-friendly products. The Trident has this material shaped into a burly blade and packaged in a handle that breaks glass, cuts cord, and engages and stows the blade quickly and securely. Serrated and straight-edge versions are available. The whole package is a little heavier and bulkier than our Editors' Choice product. For everyday carry the hardened steel "glass breaker" nub is more prone to wearing through your pants pocket liners than knives with a smooth exterior. Over time the wear and tear can be noticeable. You should favor the tactical attributes of the SOG for it to be a better choice than some of the others we assess. This is the definition of our Top Pick: a product that does very well for a niche user. This review is crafted by OutdoorGearLab Senior Review Editor Jediah Porter. Aside from testing gear, Jed's main thing is guiding skiing and climbing in the mountains as a certified American Mountain Guide. Outside of climbing and guiding, he can be found mountain biking, canoeing, hunting, fishing and trail running. Jed calls Wydaho's Tetons home, but frequents Alaska and South America for larger mountain objectives. To start this review we considered well over a hundred knives in the marketplace, then selected the 19 most promising models. We tested with a combination of controlled tests and daily use. Daily use ranged through routine tasks like simple food preparation and opening packages to more specialized uses like home improvements and automotive repairs. Controlled tests consisted of side-by-side cutting of materials like rope and webbing, whittling and even boring holes with the tip of the blade. We paid attention to blade integrity, ergonomics, portability and durability. 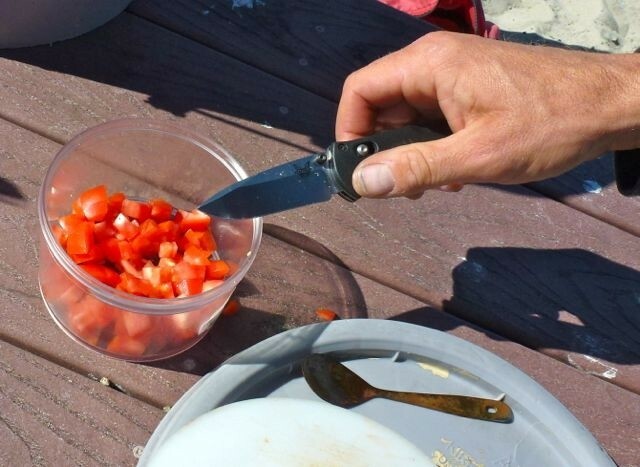 If you aren't already a regular pocket knife user, you may be surprised at just how handy one can be. Our comprehensive review should very well help you choose the right knife for you. A selection of tested pocket knives. From left to right: Victorinox Climber, James Brand Chapter, Kershaw Chill, Benchmade Mini Barrage, Opinel No 8, SOG Flash II, Benchmade Barrage. The quality of pocket knives varies a great deal. On one end of the spectrum are very inexpensive and largely mass-produced pocket knives that are little more than toys, often found at places like gas station checkout counters or county fair booths. These knives do not work well and should be avoided. At the other end of the spectrum are small batch or even "one-off" pocket knives meticulously designed and manufactured by cottage producers. These knives can be very, very good, but ridiculously expensive. What we have tested fits between the two extremes. Our entire selection is widely available and of high-quality. Even within this range, price and quality vary. Your purchase price should correlate with how much you plan on using your knife. If you use it hours a day for decades, spending more will get you better blade steel and hinges, and locks that last, plus carry options that blend seamlessly with your life. For more occasional use (or for those that are prone to losing small possessions), less expensive knives work well. Little confuses pocket knife shoppers more than the over-simplified "sharpness" of a blade and the fact that it declines with use and must be augmented and maintained over time. First of all every knife must be sharpened after some amount of use. Different materials and designs will hold an edge longer, but all will eventually need some TLC. There are professional knife sharpening services as well as a whole host of commercially available sharpening kits for home use. Additionally, the manufacturer of Editors' Choice Benchmade Mini-Barrage 585, Benchmade Barrage, Benchmade Griptilian 551, Benchmade North Fork (all reviewed here), and a whole line of other knives, will sharpen these knives for the life of the product for a small handling fee each time. The process of designing a blade starts with the material. All of our reviewed knives have blades made of some variety of steel, a metal made of mainly iron. In one of several processes, that iron is mixed ("alloyed") with small amounts of carbon and often other elements, the possible variations being virtually endless. Steel for a knife must be hard enough to resist the abrasion and deflection of the material being cut. However, it must be soft enough to bend at least slightly in the face of significant forces and to respond to commonly available sharpening protocols. Too hard and the brittle steel will be nearly impossible to sharpen. Too soft and the steel will lose its edge rapidly. For a dizzying array of steel types, visit this page. In our review, a few knives use highly regarded blade materials. Notably, the SOG Trident Elite's "AUS-8" and the "154cm" and "S30V" on the Benchmade knives are very expensive and well-tuned blade steels. Cutting corrugated cardboard is deceptively hard on your knife's edge. Impurities in the cardboard matrix dull the edge quite quickly. We accelerated wear on our tested knives with extensive cardboard cutting. Our edge integrity comments draw on this test. Know two things: decent knife steel is inexpensive enough that all branded knives (but not truck stop or flea market knives) are now made with good-enough metal. Most manufacturers of high-quality knives advertise the type of steel they use. How the steel is handled is as important as the raw material. Once a manufacturer chooses the steel for a knife, it is shaped and then hardened in some variation of a heating-and-cooling process. Various types of hardening result in different characteristics. After hardening the steel's edge-holding qualities are well established — provided the blade isn't exposed to enough heat to reverse the hardening process. Buck Knives, for instance, is known to use relatively soft steel ("420hc") but has an industry-leading heat treatment. The result is that the Buck 110 Folding Hunter we tested has an excellent and powerful blade, despite its cheaper materials. The factory edge on this knife virtually jumps through ripe tomatoes. And with Benchmade's "LifeSharp" program, they'll tune it up as often as you want and as long as you own it. Once a blade is shaped and hardened, the cutting-edge receives its final grind. Knife edges can be tuned for different tasks. The thick blade of the SOG Trident Elite is sharpened to a steep angle that preserves the edge during heavy cutting, but isn't quite as "sharp" for finer tasks. The blade of the hybrid tactical Kershaw Blur is also sharpened to a steeper angle. On the other hand, the fine tiny blade of the Victorinox Classic starts thin and is sharpened thinner, making for a very sharp yet fragile edge. The Opinel No. 8 and Best Buy Kershaw Chill are both similarly slender. The procedures, facets and angles used to finish an edge further influence the initial sharpness and edge-holding ability of the blade. All-around, modern knives like the Spyderco Tenacious G-10 and the Editors' Choice Benchmade Mini Barrage have blade geometry that splits the difference between the above extremes. As with steel hardness, there is no single perfect edge finish. Too narrow an angle and the blade's leading edge is too thin to resist deflection and to dull, while too steep an angle on that leading edge doesn't feel nearly as sharp in actual use. Feel free to investigate the different characteristics of the hollow grind, the edge angle, and single vs. double bevel. Or rest assured that knife manufacturers have this figured out. Follow their instructions for proper care and your knife will serve you for years and years. Close up of the Leek's simple "liner lock". Also, but not shown, the Leek has a clever and simple sliding "tip lock" to hold the blade closed. In summary, knife "sharpness" is a function of a wide array of variables. A user's long-term experience with the pocket knife depends as much on his or her maintenance as it does on initial manufacturing. The manufacturer has balanced numerous conflicting criteria at every step in the process, and all of the pocket knives we tested demonstrate more-than-adequate edge integrity and sharpness. Notes on blade shape and cutting-edge design: All the knives we tested have some "drop-point" or "clip point" shaped blades; these two are the most versatile blade shapes, similar but subtly different. Also, note that many blades in our test and elsewhere can be either straight or serrated. Neither is better, overall, than the other. Serrated blades cut tough materials, especially rope and webbing, more efficiently while straight blades are easier to sharpen. The OutdoorGearLab team generally prefers straight blades. Hybrid blades, partially straight and partially serrated, can address a variety of needs. Use and sharpen the straight portion regularly and save the serrated portion for tougher tasks like cutting carpet or rope. Like any hybrid piece of equipment, hybrid straight/serrated blades can be seen to have either the best of both worlds or the worst of both worlds. REI has easy-to-digest descriptions and illustrations of common blade shapes on their website. Properly sharpened, and there-when-you-need it, a knife still needs to be usable. Heavy cutting requires a sturdy handle that doesn't pinch or pressure the user's hand. In many ways, portability and ergonomics are direct competitors. The most ergonomic knife has an elongated rounded-profile handle that fills a loosely clenched fist. The most portable knife is the smallest and thinnest. Our scoring reflects that tradeoff. The most user-friendly knives were the least portable, and vice versa. It is up to you to evaluate your needs and choose a blade that strikes the balance you seek. The tool needs to be easy to open and smooth to deploy and stow. The locking mechanisms should be intuitive and simple. One-handed blade deployment is best. So-called "assisted opening" knives are even easier to use. In our review, the Mini Barrage, SOG, and two Kershaw knives, among others, have assisted opening blades, which we prefer. Note that "assisted opening" is a knife qualifier that appears with some frequency in local knife regulations. Knife ownership and carriage is regulated locally in the U.S. (state, county, and municipal laws and rules apply) and the laws vary considerably. In some places some or nearly all of the knives we have reviewed are illegal to carry or even possess. This link to the American Knife & Tool Institute provides organized, state-by-state laws on knife possession and carriage. Ideally, for pocket-clipped knives, the clip is oriented such that the tool can be pulled from the pocket and thumbed open without regripping. Tested Benchmade knives are made this way and can be arranged to work that way in either left or right pocket. Why other manufacturers do not employ this simple strategy is mystifying. The Spyderco Tenacious G-10 has a pocket clip that can be user-configured to hang in your pocket in one of four different configurations: tip up or down and left or right thumb activation. For those unclear how they wish to carry their blade or can't find a knife to match their preference, this attribute alone can favor the otherwise average Spyderco. The Editors Choice Benchmade Mini Barrage just above its full-size sibling Benchmade Barrage. We like the smaller one, overall. Otherwise they are identical. Both Victorinox knives have multiple tools. While none of the features can be opened with one hand, all can be engaged with even the most closely-trimmed fingernails. The Buck Famous Folder, Old Timer 180T Mighty Mite, and Opinel also open with fingernail slots. All other knives have some form of one-handed opening. Opening the Opinel requires two hands. This is a little more primitive than some of the newer offerings. The CRKT Jettison is a large pocket knife with challenging ergonomics. A disproportionate amount of its bulk is in the Jettison's blade. The handle is similar in size to that of the Best Buy Kershaw Leek, but the blade is larger than most. This unusual balance makes for a knife that is tricky and a little uncomfortable to use. The Opinel No. 8 also has unique ergonomics. The wooden handle, nearly perfectly round, feels nice in the hand and is more than adequate for light duty tasks like cutting food. For heavier use like extended whittling or cutting of rope and webbing, a more oval-shaped handle profile like that of the Benchmade Griptillian 551 is preferred. Whittling isn't a common task for your pocket knife, but when you need to do it, a sturdy knife goes a long ways. The diminutive James Brand Chapter has a simple design that opens with one hand. Because of a slightly sticky blade and the overall dimensions, the user's thumb is a little vulnerable to cutting on the blade while opening. Users learn to deal with this concern, but our test team had some trouble on the learning curve. A pocket knife is only as good as it is handy. Will it be there for you when you need it? Bulky and heavy knives will be left at home. Small knives floating around in a glove box or crowded jeans pocket will be too time-consuming to dig out. The most portable knives in our test were either quite small and equipped to hang on a keychain easily, or had a low profile and a tight pocket clip. By far, the Victorinox Classic SD Swiss Army Knife is the most portable of the knives we tested. The Buck 110, Jettison, Benchmade Barrage and the Spyderco Tenacious are all bulky and cumbersome. In these cases, however, bulk and weight can be justified by some for their function and versatility. The Benchmade Griptillian is similar in size to the SOG Trident Elite but is a little lighter. Similarly, the Top Pick SOG tactical knife is comparable in size to the Buck but is quite a bit lighter. With large and small knives in the review, two of our general purpose award winners (Best Buy and Editors' Choice, Kershaw and Benchmade Mini-Barrage, respectively), sit exactly in the middle. For most users, the size of each of these is manageable while still being functional. The Kershaw is thinner than the Barrage, but both are equipped to clip discretely into the user's pocket. The Opinel No. 8 is also on the compact end of the spectrum. It is similar in overall volume to the Kershaw Leek, but they differ in shape. Both are easy in the pocket, but the Leek is longer and thinner while the Opinel is super light. The Leek and Opinel both have very thin blades. The other Best Buy, the Kershaw Chill (honored for its low price with excellent construction), has almost the same dimensions as the Kershaw Leek. It is the smaller closed profile of the Benchmade Mini Barrage that sets it ahead of sibling, unqualified Barrage. In your pocket this small size difference is significant. In the models we tested, quality of manufacturing aside from the knife blade itself varied far more than the quality of the blade. Handle, hinges and locking mechanisms revealed the attention paid to detail. Sturdy parts and materials, tight design, close manufacturing tolerances, and carefully thought out construction stood out right away and only increased in how much we noticed as time and usage wore on. Overall, construction quality more than adequate for all test subjects. We had no failures or breakages. Our evaluation of these knives' construction quality was mainly subjective. Does it "feel" sturdy and confidence-inspiring? When this assessment came up short for a given pocket knife, it inevitably followed that some aspect of the mechanical function of the knife would act finicky. Locking mechanisms are the most vulnerable to construction quality. Well made knives like the Kershaw Leek open and close smoothly every time. Less expensive options like the Gerber STL 2.0 Fine Edge cut just fine, but the locking mechanism can be difficult to disengage. Similarly, the expensive Benchmade knives, whether the assisted opening Mini-Barrage and regular Barrage or standard opening Griptillian 551, open super smoothly with all the various locks and options working efficiently every time. Smaller knives are harder to get fine-tuned. Their miniaturized components don't leave much room for error. An example is a comparison between the somewhat classically designed Buck Famous Folder and the Old Timer. They look similar and are made with similar materials and designs. The Buck has a massive construction and works smoothly. The Old Timer is tiny, and the locking mechanism sometimes takes some fiddling. Also quite small, the Victorinox Classic seems to escape some of the issues of other small knives — all its components work well and smoothly. No features on the Classic lock, which likely saves some hassle. The Opinel No. 8 has unique construction. It is, first and foremost, super simple. With only five parts (handle, blade, hinge pin, and two collars that serve as the locking mechanism) the overall build is very clean. The result is light and reliable, but a little uninspiring; also, opening and locking requires two hands. In our test, only the Victorinox Classic, Victorinox Climber, Kershaw Blur, and "tactical knife" SOG Trident Elite have any functions besides a primary blade. The tactical knives are designed for rescue usage. Paramedics and firefighters use the burly blade, seatbelt cutter and glass-breaking punch. The rest of us may fear the need to cut our seatbelt and bash through the window of our car, but we'll probably tire of carrying such a burly pocket knife long before using these features. The SOG Trident Elite is considered a full tactical knife, with both seatbelt cutter and glass breaking punch. The Kershaw Blur is a hybrid tactical knife with just the hardened and pointed glass breaker. Only a couple knives in our review have extra functions. The Victorinox Climber has a few handy extra attributes. The tiny Classic Swiss Army knife packs a versatile punch in a small package. For the day-to-day user, the combination of little tools on this knife could be almost perfect. From office tasks to personal grooming to light home maintenance, the Victorinox Classic's simple combination of features will get the owner through most of life's challenges. Close up of the added features of the Black Kryptonite knife, showing the dedicated v-cutter blade and steel glass breaker nub. The larger Victorinox Climber has basically the same features as the Classic, but these features are larger. The Climber also adds a corkscrew and a couple other small things. We are reasonably certain that readers of this review are not only unclear about which pocket knife; they are also not entirely sold on pocket knife ownership in the first place. To cut to the chase, there is a big difference between a crappy knife and a good one. Picking whatever is handy and cheap might work, but you won't use it nearly as much as you will a more carefully selected tool. So consider your choice carefully and trust that a smart selection will be rewarded with service that exceeds your expectations.